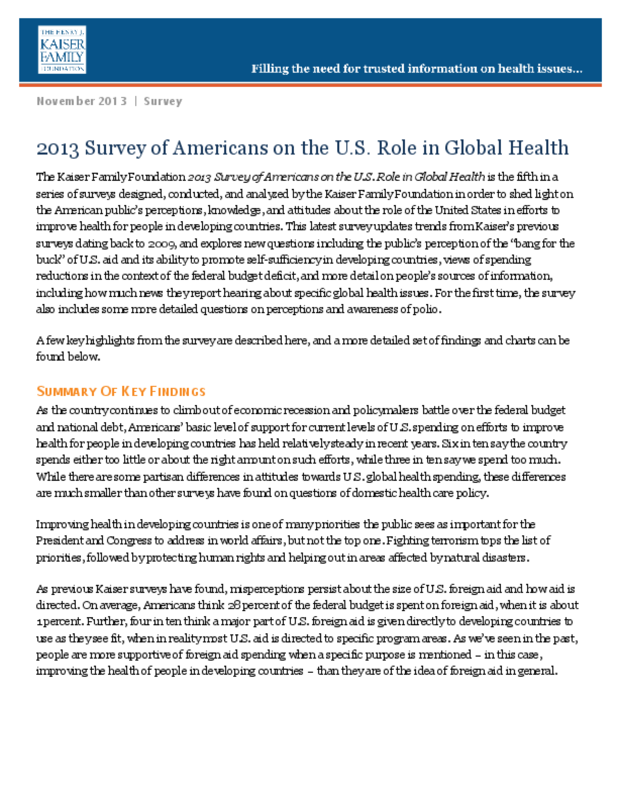 The Kaiser Family Foundation 2013 Survey of Americans on the U.S. Role in Global Health is the fifth in a series of surveys designed, conducted, and analyzed by the Kaiser Family Foundation in order to shed light on the American public's perceptions, knowledge, and attitudes about the role of the United States in efforts to improve health for people in developing countries. This latest survey updates trends from Kaiser's previous surveys dating back to 2009, and explores new questions including the public's perception of the "bang for the buck" of U.S. aid and its ability to promote self-sufficiency in developing countries, views of spending reductions in the context of the federal budget deficit, and more detail on people's sources of information, including how much news they report hearing about specific global health issues. For the first time, the survey also includes some more detailed questions on perceptions and awareness of polio.